of robust manufacturing proven endpoint software combined with a reflectometer head which includes a light source and spectrometer. The optical sensor configuration varies depending on how it is mounted to a specific tool type. The operating principle is fairly simple. A light source is used to illuminate part of a wafer while it is etched. The reflected light spectrum from the wafer changes based on film properties/thickness. Lightwind software tracks the changes in reflected spectra and endpoints based on a preconfigured endpoint algorithm. Shown above is the end point simulator used to create an endpoint recipe. 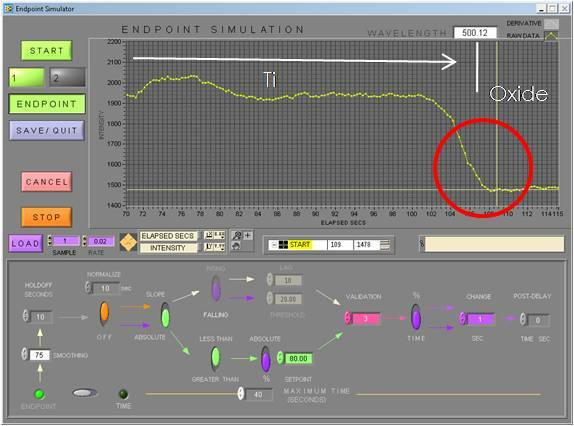 The trace shows the simulation of endpoint from actual process data during the wet etch of Titanium over thermal oxide. The steep drop shows the Ti as it clears. Endpoint can be called anywhere along the downward slope as well as when the signal goes stead state near zero.